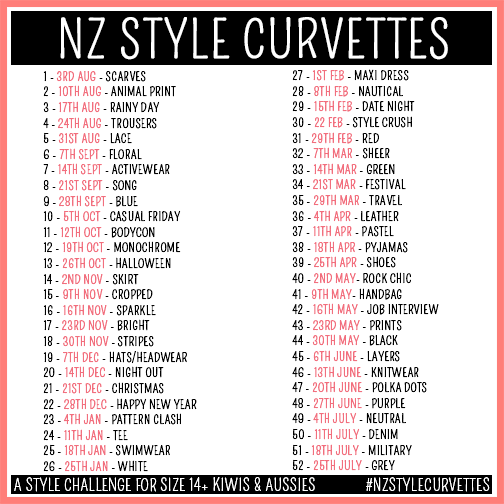 This week, the NZ Style Curvettes Outfit Challenge theme was ‘Tee’. After the first week, I decided that I could definitely do more than one outfit each week to fit the theme, and I’ve stuck to that for, like, a month now….until t-shirt week – I didn’t factor in how much my utter disdain for casual wear would stunt my plan! To properly explain my intense dislike of casual wear, I’ll have to take you back a few years…. 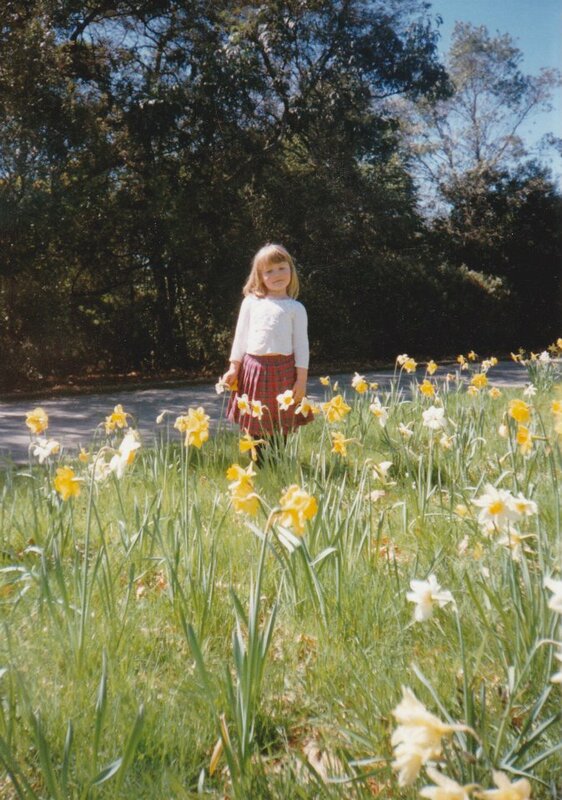 Dunedin Botanic Gardens – 1994 (?) – My favourite plaid skirt! 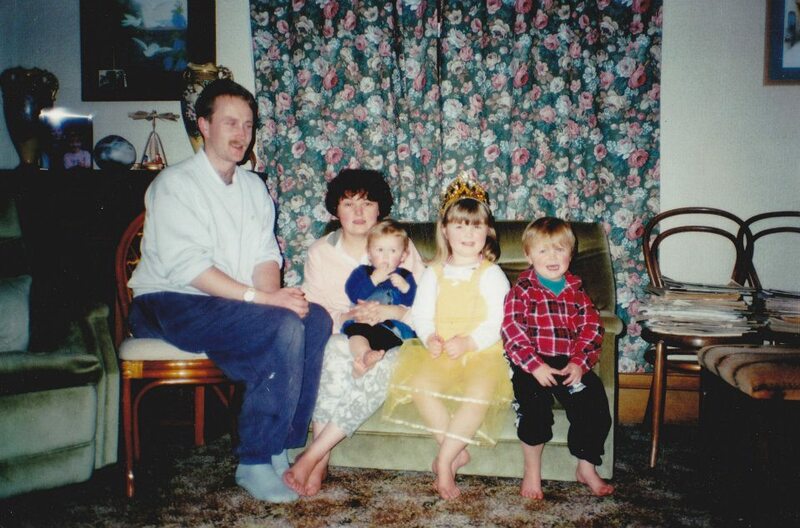 Teeny-tiny Fran was all about colour and costumes, and inappropriately fancy outfits at every possible occasion. Sometimes things were more casual than others, but for the most part, I’ve not had any interest in being a jean-and-tshirt person. This position on casual wear was further cemented when I reached high school. 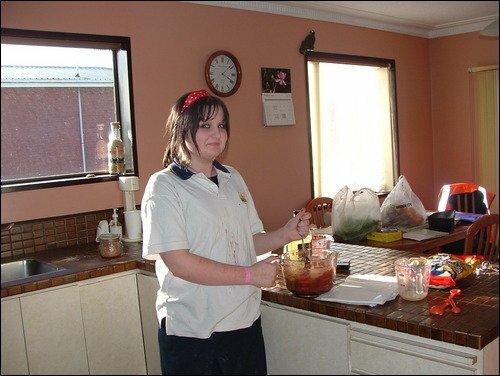 I had quite liked my school uniform at intermediate – A red kilt, with a white button up shirt, and a red wool jumper – and while I have never been the biggest fan of being told what to wear every day, at least this was a tidy uniform, and we looked pretty fancy. My uniform at Bayfield, however, was dreadful. Designed to be comfortable and easy to wear, the polo-shirt / polar fleece / box-pleat skirt combo was truly atrocious. I abandoned the gigantic polar fleece jumper early on, after accidentally melting it to my back while sitting next to a heater, but that meant that for the next 4 years I lived in these nasty polos. I still maintain that the girls had to wear skirts so you could tell they were, in fact, girls, because these polos left literally everything to the imagination. And I know that school uniforms aren’t supposed to make a fashion statement, but how is a teenage girl supposed to take pride in her uniform (and thus her school) if she is forced to wear something that is so exceptionally unflattering? Over the years, I tried to make adjustments – Tucking my shirt into my high-waisted uniform skirt, shortening and adjusting the sleeves on my shirts to fit better, adding darts – anything to help it look more respectable, but each time, I was told to ‘wear my uniform properly’. I eventually gave up. If my school didn’t care that I wanted to look tidy, then why should I? By the end of 6th form all my skirts were covered in paint, and my shirts were not much better – to the point where I had to borrow a uniform from the school for prizegivings and choir performances! 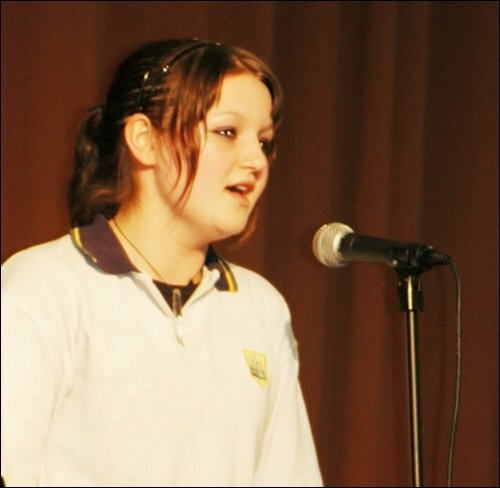 6th form Prizegiving – 2007 – My last day in the dreaded polo! 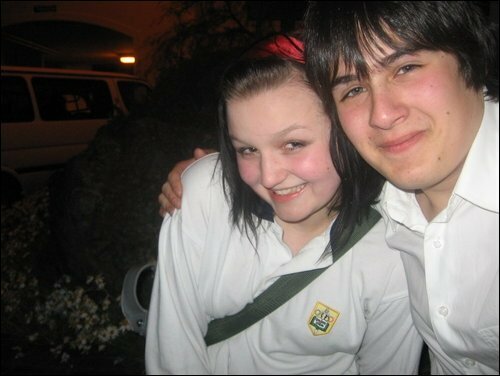 As soon as I reached 7th form I was allowed to wear mufti, and while I was still smack bang in the middle of my angsty-teenage baby-goth-punk phase, I spent most of my days in pencil skirts, or black denim capris, and an assortment of corsets, or button down shirts with waistcoats and blazers. Even though they were ‘alternative’, my clothes were always particularly well tailored, which became so important to me – to the point where I ended up working for a tailor, so that I could learn more about how to best alter things to fit. This love of well tailored clothing evolved, over time, into the style I wear now – 1950s and ’60s silhouettes in modern prints and bright colours, interspersed with the rare plus-sized vintage find, and plenty of coordinating accessories – leaving very little room for ‘sportswear’ and tees in my wardrobe. 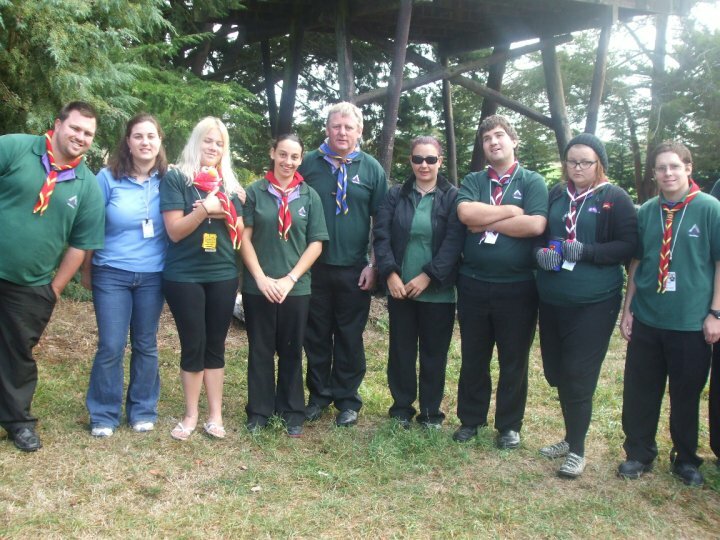 Moot 2010 – 2nd from the right in my polo, and certainly not thrilled about it. 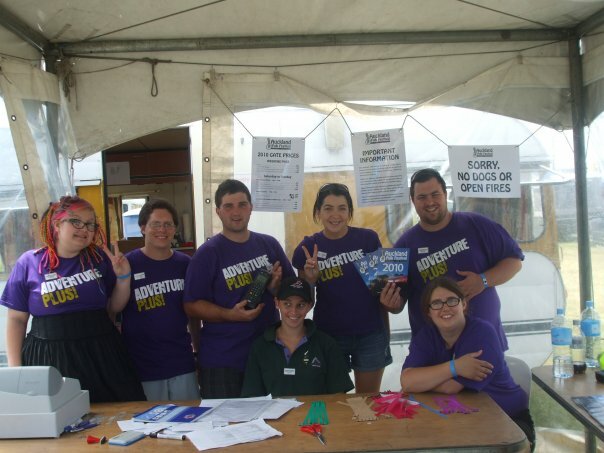 2010 Auckland Folk Festival – The rainbow-haired one on the left…obviously! So this is where the outfit challenge comes back into this post. The only tee that has actually had any real wear, and the only one that is still in my wardrobe now, is this one. I’ve had this shirt since 2008, and it’s, like, 6 sizes too small now, but I’m not ready to give it up! 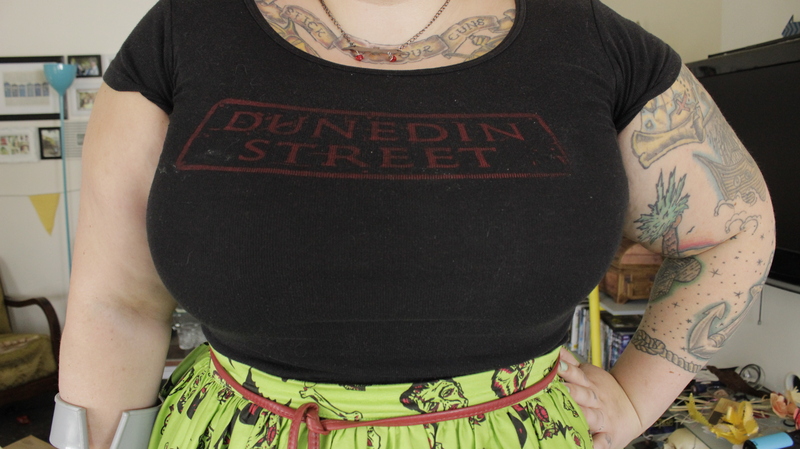 I screenprinted it myself, as part of the merchandise run we were doing for the ‘Dunedin Street’ music festival that the Volunteer Otago Youth Branch put on as a fundraiser, which I helped to organise and performed in! For the last 8 years it’s been hanging in my wardrobe, getting less and less wear as my style (and size!) has changed, but I’ve held onto it. It’s a bit of a stretch to wear it now, but it’s a really nice reminder of my years of performing in Dunedin. For a long time after I moved, I resisted wearing it, because I didn’t like explaining to people that I used to have lofty goals of singing for a living. Giving up performing was tricky enough, but admitting that I wasn’t good enough to make it big was something else entirely. But now that I’m doing something that I genuinely love just as much as I love music, and have had some reasonable success with, I’m not too proud to wear this shirt out and field questions about my past life! 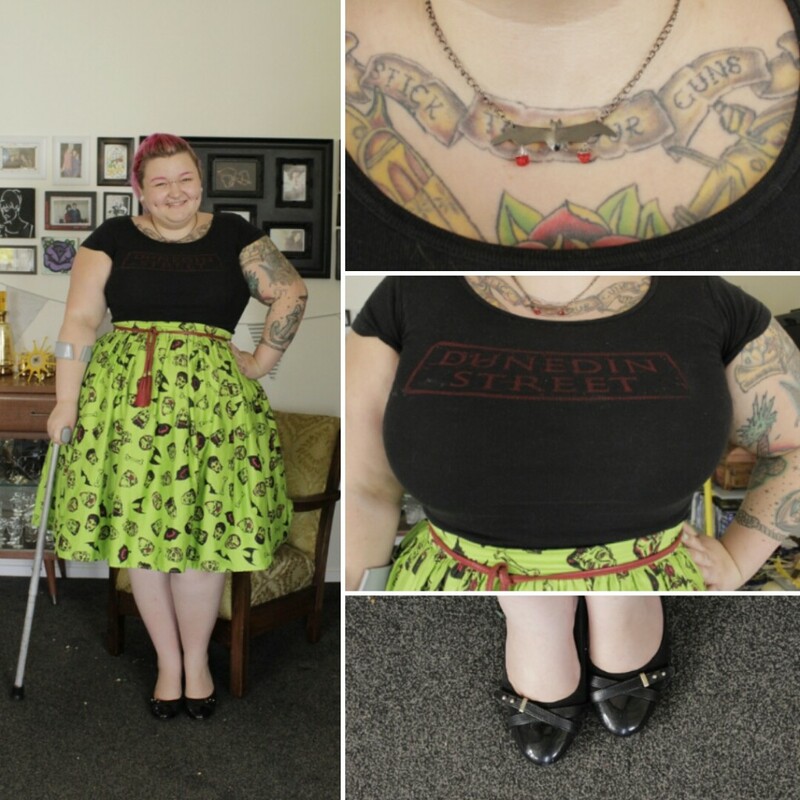 My skirt is a Deadly Dames one, with a fantastic and quirky monster print designed by Micheline Pitt. It’s probably the only thing I’ve bought brand new (and full price!) from PUG, but as soon as I saw it in the ‘Coming Soon’ section, I knew I had to have it! I ordered it as soon as the email came to announce it’s release, and I’m pleased I did, because it sold out really quickly! This style is based off the PUG ‘Jenny’ skirt, but is knee length, rather than tea-length, and it has pockets! As far as fit is concerned, I’m usually between a 2XL and a 3XL in PUG clothing, but the last ‘Jenny’ skirt that I bought in a 2XL wasn’t the most flattering fit, so I decided to size up, and I’m glad I did! The 3XL doesn’t dig in around my waist, and the waistband lies flat, which always makes an outfit look more polished. It also means that I don’t have to disguise the top with a wide belt, like my ‘Jenny’, which is great, because often wide belts just make my waist look bigger! And, you know, it’s got monsters on it. So that was me for this week just gone. My first attempt at rocking a t-shirt in at least a year. Wearing it again, just for this one day, reminded me that just because something has strong links to a part of you that you don’t really identify with anymore, doesn’t mean it’s not still ‘you’. Next week I’ve got another exciting photoshoot to share with you all, as well as the next outfit challenge theme, which is Swimwear! Now im.usually better dressed as i am no longer ashamed . You look amazing!